Other Equipment: i have "normal" armor and shield but Awe!!! version of staff, maybe that's the reason? Other Equipment: Golden Paragon Plate (90), Guardian Dread Raiment (87), Dagger of Awe!!! Cure Poison spell doesn't grant immunity to Wyvern toxin. Bug details: Guardian Dragon deals almost no damage. Before bug occurred: I'm using the Staff of Awe in a fight and click the Attack button. During Bug: The Guardian Dragon deals miniscule damage compared to what it should do. In the past two days the lowest I've seen is 11 and the highest is mid-20s. After bug: Monsters have more remaining HP than they should, and sometimes are still alive when they shouldn't be. Item Bugged: I use the Staff of Awe, but I saw someone else report this with a Guardian Blade, so I suspect it's in the skill/ability of summoning the dragon, which they both proc. Other Equipment: Various, but typically Mankind's Determination and Inquisitor's Ardor or Guardian Boreal Bolt Plate--my staff is Earth-element, so I use it against Wind monsters. Did you log out and log back in? It has happened across multiple sessions, so yes. Did you clear cache? No. Did the bug happen again? Yes, every time the Guardian Dragon is summoned. Here is a screenshot of the attack and another of how much HP the mob had after it. Ah, and I guess I need to link my char page too? Type of bug: error, crash, something along those lines. 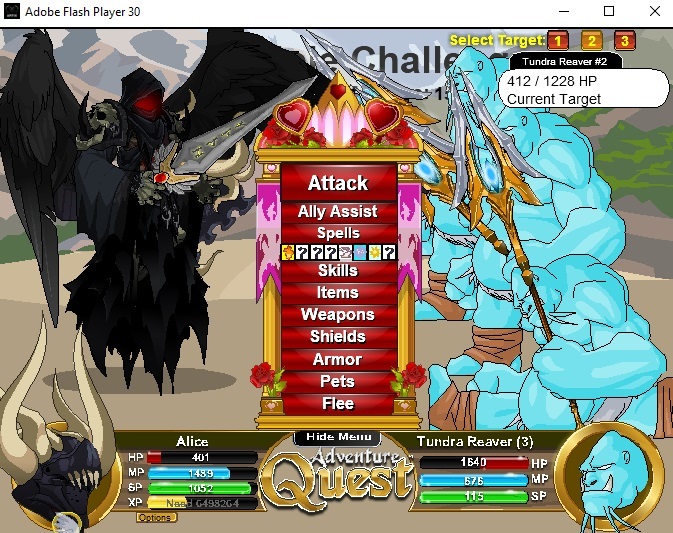 Bug details: When using the Blade of Awe, it will animate as if using an ability and then get stuck in that position permanently until I refresh the page. Before bug occurred: Entered combat sequence and went halfway into a battle. During Bug: Weapon ability animates and nothing happens. After bug: bug doesn't change from it's still position until page is refreshed. Before bug occurred: Entered combat, equiped everything, clicked first attack and poef (happend twice in a row today alone). During Bug: Weapon special animates (i guess guardian dragon, all others i have seen since the update) and nothing happens. After bug: doesn't change until page is refreshed. Item Bugged: Staf of Awe!!! Flash version: always up to date. Bug details: Mountain Cudgel Gi's Level 6 skill permanently (tested for 7 turns) dazes opponent so long as remains in armor. Daze disappears when armor changes. Before bug occurred: Used Crushing Blow skill of Mountain Cudgel Gi on monster. During Bug: When monster attacks text appears saying it is dazed. Bug details: Neko subrace passives proc the bleed+burn on Am-Boss after its ambush attack before battle starts. During Bug: I got hit by the Am-Boss ambush attack (Before Battle Start) and noticed that there was the burn and bleed proc. Other Equipment: NOT NECESSARILY RELATED: Underwyrmling, Poutine Golem, Accordion Shield and Samukematsuri Warbow were equipped before battle. Screenshot link: https://imgur.com/a/4sZP6i6 - album that shows battle state, my status, then Am-Boss status (before and after one turn has passed). Did the bug happen again? Yes, but it is dependent on status effects. Bug details: while casting Ornament Golem Assault in a werepyre armor and the monster is already choked and panicked. Before bug occurred: just a normal fight against a normal monster, playing around with werepyre's panic status and interactions with other similar spell effects. Item Bugged: I believe it's Ornament Golem Assault but it might be the werepyre forms. Did you log out and log back in? Yes. Did you clear cache? Launcher version, no cache. Did the bug happen again? Yes, pretty much the same circumstances too, but I don't know the exact moment when it happens, just sometimes it does. Nilak donation drive guardian shop trophy sword element is set to light instead of ice and type is reverse recognized. The Werepyre elemental variants summon guests that seek only between earth and darkness. The 16th cupcake level 150 version is not clickable and still retains the old MC. The other versions seem to have been updated however. The level 150 Gorarog form armor doesn't count as a Guardian item for some reason. Click for character page as proof. With that in mind, could I please get the permanent skull face added so I don't need to run through the quest a 4th time? PS: As an adventurer werewold race I also have the Guardian-only werewolf transformation. armor in the extra no-drop slot for some reason... ??? 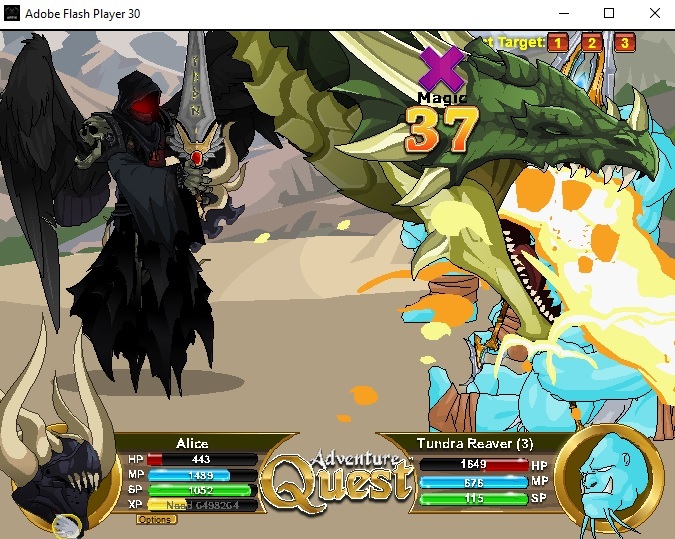 Bug details: According to info subs ( http://forums2.battleon.com/f/tm.asp?m=22252325&mpage=10&key=ｶ ), the "Health Vampire" special on awe weapons is supposed to allow a player to regenerate health points based on 150% of the damage inflicted to a monster, but the 50% bonus is missing. Before bug occurred: Equipped my awe weapon. During Bug: Health Vampire special triggered on my awe weapon, dealt 402 damage to a monster with an element that it had 200% resistance elemental modifier on, and regenerated only 201 health points, not 302 [(402 x 150%)/200%] health points as it was supposed to. Bug details: Default no-drop shield is Shield of Awe!!! but cannot be changed and is not recognised as such. Before bug occurred: I changed from UltraGuardian shield to Shield of Awe (Regular). I upgraded the Shield of Awe to the Shield of Awe!!! through the Golden Giftboxes and then attempted to exchange it for the UltraGuardian shield. My Z-tokens were taken but my shield remained the Shield of Awe!!!. During Bug: Changing to the UltraGuardian or other Guardian shields offers a temporary variant of the shield, with no option to permanently change for 20 Z-tokens. Taking this temporary shield does indeed work as it should. Talking to Valencia about the Shield of Awe gives me the option to change it permanently or temporarily. Clicking 'Temporary' has no effect, as if not an actual button. Clicking the permanent option takes 20 Z-tokens, but nothing changes, and Valencia gives the following message: "Hmmm.... this is not good. There seems to be a problem swapping your item. This is a technical issue. Please log out and try again." After bug: Bug is constant. Swapping between the Werepyre variants while transformed will use additional SP (continuing to swap will eventually use all of your SP). Edit: This still happens when 'swapping' to the same variant you're already using. Bug details: Regarding the Deft Armor of Awe - when I successfully block the last attack there's no HP heal. When I first got the armor it worked fine, but now nothing special happens. The last thing I did before I noticed the problem was the Wicked King quest from Mt. Thrall, or possibly the stat trainers. The Awe armors have been updated. Deft no longer heals on block.